About 7:10 am two candidates a 6pt & a spike were jockeying for position for a ride in my truck. The 6pt. was behind too many limbs so the spike won out & got to ride home with me. The new Stalker Wolverine SL is officially broken in. Nothing like 'breaking in' a new bow.Good for you! Congrats Terry. You sure give an awful lot of free rides. Maybe it's just the way I was brought up..... Back in my younger days, getting a "Buck" was something to be proud of!!! Getting a "Big Buck" was something that made you practicaly famous! Getting Big Bucks on a regular basis, mean't that you were one heck of a hunter!!! Why...? Big Bucks, were few & far between. Now days,with all the P&Y class, Inch spread, score, QDM Management hype..... It seams like people/Game commissions, are trying to grow a big buck behind every tree. Back in the day... Big Bucks, got that way for a reason. They were SMART!!!!! Many, were never seen before the day they were killed. Woodchucker, As you can see I have no problems taking any legal deer (except fawns). In my area its not over run with deer & I like eating venison. 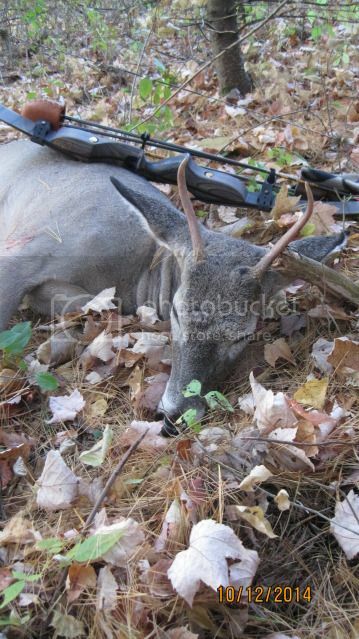 Some people won't take a spike or doe & claim they only shoot a certain size (# of pts.)buck. Thats OK with me, their choice. I just get cranked with the ones that talk down on anyone taking what they consider "not worthy" or not what they consider a trophy. Maybe I'm just an Old Fart..... But, I REALLY have a problem with this QDM/Antler restrictions, being forced down our throat!!! Maybe it's just me. I remember the days when a Big Buck was REALLY a trophy!!!!! Now, They try and grow them to make every Buck "Big"... Sorry guys, it's just not the same. Kinda like going shopping. Just let them walk by, untill you see one you want to take home.